Many plants seem to represent an archetype or personality to me, which is often a reflection of their usage in folk medicine or even stories or legends about them. Elderflower is playful and ethereal like a maiden beckoning you deeper into the woods with her youthful joy; roses are the sweet mothers who envelop you with softness and remind you how good it feels to be in your own body. But if there’s one plant that has brought me the most comfort, it is the Ponderosa Pine. Growing up, there was a tree I’d walk to whenever I was feeling upset or overwhelmed - an ancient towering Ponderosa out away from the forest’s edge, looking for miles over her sagebrush kingdom. I would pass through the arch of two smaller trees (that I referred to in my head as simply “the guardians”), then would walk out through the fragrant sagebrush to that towering tree. I’d nuzzle my nose into the crevices in her jigsaw puzzle bark and inhale the sweet vanilla perfume and know that all was right with the world. I could sit there for hours listening to the cacophony of birdsong in the branches above as I rested in the sunlight under her protective branches. I took comfort in the knowledge that she’d stood there, tall and graceful, for centuries. She’d seen towns come and go, mountains grow, and many generations of people leave their mark on the land. Her presence felt stable, consistent, unconditionally loving. A fallen log below her boughs became on elf my favorite “sit spots” during my adolescent years - a place to return to to remind myself of who I was. Then one spring, I got very ill - too sick to make the hike to visit her. We got heavy rains which saturated the soil, and then the winds came. Hundreds of trees across the valley came crashing down in those storms, their steadfast roots previously loosened by the moisture. When I finally was well enough to walk out to visit her, I discovered that my beloved Grandmother Ponderosa had come crashing to the ground. It was absolutely shattering. I fell to my knees, sobbing, as I experienced the first great loss of my life (I’m still tearing up just writing about it now.) It may seem dramatic to be that upset about a tree, but she can come to mean so much more to me - a kind of sacred kindness, a place of warmth and safety. This elixir is my ode to Grandmother Ponderosa and all that she represented to me. I love adding it to everything from warm milk to pancakes when I’m craving that strong quiet support and unconditional love. To me, it tastes like sunshine in a bottle! Perhaps you’ll find the same comforting presence in your own brew. Since it’s extra-special to me, I dressed up the bottles with burgundy sealing wax. I’ve also included directions on how to make that as well, just scroll down to below the recipe. Do you have any plants that you feel a special connection to? Tell me about them in the comments! 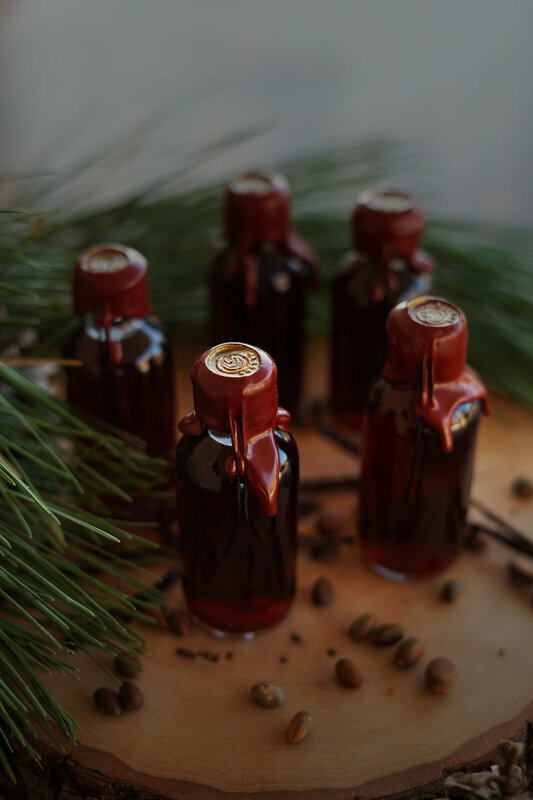 Place the vanilla beans into a sterilized glass jar and cover in vodka. Let sit for 2-3 months. Gently crush the pine nuts in the shell and add them to the jar, along with the pine cones and pine needles. Let infuse for another 4-6 weeks. Strain through a fine mesh sieve and bottle. 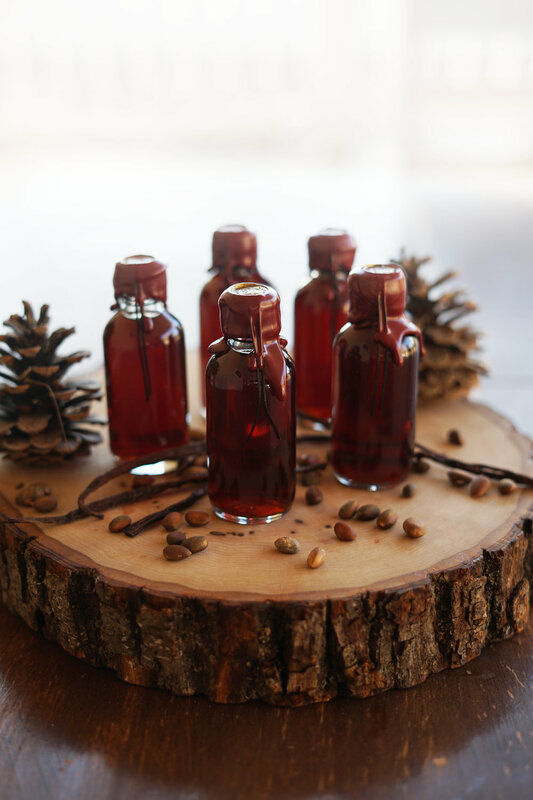 Making your own sealing wax is a fantastic way to dress up home-infused extracts, vinegars, cordials, and other shelf-stable treats. Keep in mind that you’ll be dealing with hot wax, so this activity is not appropriate for children and you need to take some safety precautions. First, prepare your work station. This is a messy process, so you’ll want to cover it with parchment paper or aluminum foil. You’ll also need a protective glove in case you spill any of the wax as you dip. While everything is melting together, tie some string around the neck of each bottle, then put it across the top and tape down (at least halfway down the bottle.) The string will make it easier to remove the wax when you’re ready to open the bottle, and the tape will hold it in place while you dip it. Stir the mixture in the can every 10 minutes or so until everything is melted using the bamboo skewer. Stir well to create a smooth mixture. Remove the pan from the oven. Put the heat-proof glove on your dominant hand. Carefully dip the top of each bottle in the warm mixture, then flip rightside-up to cool. You can stamp the top with your wax sealing stamp now, if you’d like. Tip: the crayons will make the mixture more brittle, the hot glue will make it more flexible. Adjust the proportions to your liking. If you don’t like the way a bottle looks when it’s been dipped, the mixture is fairly easy to peel off when warm. You’ll need to re-heat it at intervals if you’re using it for lots of bottles. It takes a little getting used to, but then it’s easy to get a pretty look!